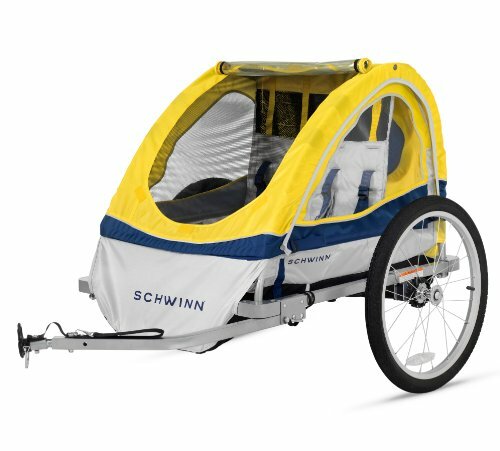 The Schwinn Echo double bike trailer is equipped with 20″ alloy rims with air tires that provide performance and style. The large window and mesh surface area for better transparency and style while the bug screen keeps the child insect free, dry and keeps your child cool. Seat includes helmet mesh and shoulder pads for passenger comfort while the universal trailer coupler attaches to most bikes with ease.Tow behind style bike trailer, universal bike coupler will fit most bicycle rear wheels, 5-point rider harnesses with shoulder patches, safety flag for extra visibility. 20 inch alloy spoked wheels with air filled/pneumatic tires for performance and style, large side windows. Fits in the back of cars or closet. The frame collapses and the wheels remove. Comes with a coupler that will attach to most rear bike wheels. 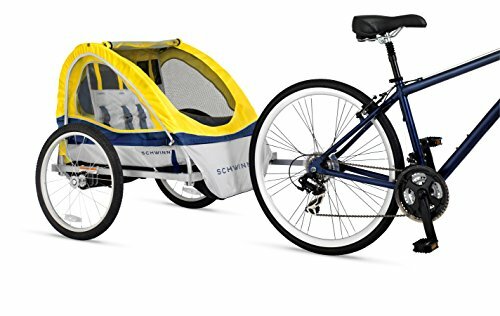 Assembled 51.8″ x 32.5″ x 31.9″‘, fits two riders up to 40lbs each. 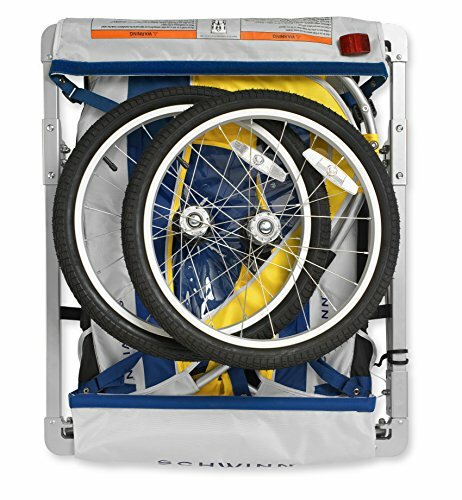 Features a small storage space behind the seat for water bottle or some cargo.